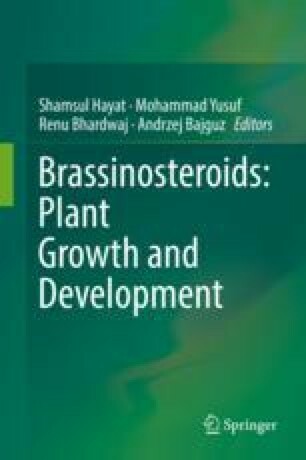 Brassinosteroids (BRs) regulate diverse physiological processes during plant life cycle. Recent years have witnessed a significant progress in elucidating various aspects of BR biosynthesis and signaling, which was achieved through genetic, biochemical and physiological analyses of mutants isolated in model and crop species. Mechanisms of BR biosynthesis and signal transduction are interconnected with pathways of biosynthesis and signaling of other phytohormones. These interactions form a complicated network of dependencies and enable a coordinated regulation of the various physiological processes. It was also reported that components of the BR signaling pathway, playing roles of both positive or negative regulators of the process, are involved in mechanisms of plant response to various stimuli and stress conditions. This fine-tuning of plant physiological reactions to various stimuli allows a balance between growth rate and stress response to be achieved. The process of identification of new components of the BR signalosome is still ongoing, and functional analysis of the new components broadens the view of the complicated network of hormonal interactions. The chapter presents genetic and molecular aspects of the BR biosynthesis and signaling and interactions with other phytohormones, which mediate physiological processes in plants. Oh, E., Zhu, J.Y., Bai, M.Y., Arenhart, R.A., Sun, Y., Wang, Z.Y. (2014). Cell elongation is regulated through a central circuit of interacting transcription factors in the Arabidopsis hypocotyl. eLife 3. https://doi.org/10.7554/eLife.03031.